HÀ NỘI — Việt Nam Basketball Association (VBA) League 2017 champions Thang Long Warriors have opened a basketball training centre in Hà Nội. It is based in UNIS School in Ciputra urban area. The centre will train 50 young players from the age of eight to 18 for two months until December 16. Thang Long Warriors’ head coach Predrag Lukic, coach Jason Benadretti and professional players at Thang Long Warriors Club will teach them. 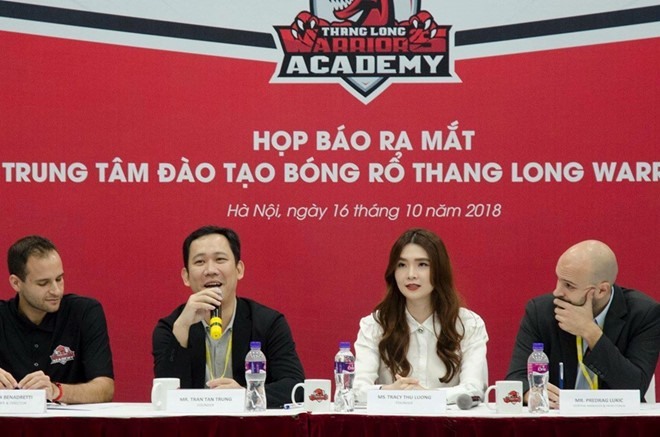 According to Tracy Thư Lương, chairwoman of Thang Long Warriors, the centre will focus on training good quality players to raise the sport’s profile in Hà Nội and Việt Nam, not gaining profit.